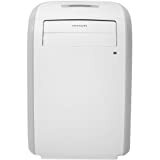 Frigidaire - FRA053PU1 : Portable Air Conditioner Review • The Air Geeks, reviews of air conditioners, dehumidifiers and air purifiers. Looking for a small, economical yet smart air conditioning unit for a quick fix in your office or in your room during the summer? Well, we think you’ll like this unit. The FRA053PU1 is a portable air conditioner that is designed to offer a cooling capacity of 5,000 BTU. It is optimized for small spaces (approximately 216 square feet according to the manufacturer, yet around 150 sq feet in real life). In addition, it features an antimicrobial mesh filter that ensures that the supplied cool air is free from microbes, much like some functions found in an air purifier. This unit is a suitable choice for small bedrooms, office stalls, and living rooms. In case you are looking for a portable air conditioner for your small room, then you should consider this unit by the American brand : it does not produce loud sound and you can therefore relax in cool environment without disturbances. So, ready for our review? We will give you the good, the bad and the ugly. Keep reading! Let’s get this out of the way : yes, the FRA053PU1 is only 5000 BTU. One of the most important factors to consider when purchasing an air conditioner is the rated cooling capacity of the system. Systems with higher cooling capacities are ideal for large rooms and vice versa. The FRA053PU1 is designed to provide a cooling capacity of 5,000 BTU and it is therefore only suitable for smaller spaces. According to the manufacturer, this unit is ideal for a 216 sq. ft space. However, this estimation assumes average room conditions and the effectiveness of the system can be influenced by the number and size of openings in your house. For most houses or apartment, we’ll be closer to a ~150 sq ft covered area. This unit is specially designed not only to provide cool air but also to ensure that it is clean and fresh. It features an antimicrobial filter that gets rid of room odors, bacteria, and other airborne particles. Its air ionizer is designed to remove various types of allergy causing impurities. We liked that this Frigidaire model is able to sanitize the air at the same time as it cools it. What about ease of use? This unit features an easy-to-use interface and electronic controls that enable users to adjust the system’s settings easily and quickly. In addition, the FRA053PU1 comes with a full-function remote control that allows users to adjust the system’s settings from any place within a room. Furthermore, this portable air conditioner has a 24-hour on/off time that allows users to set how the system goes on and off depending on their preferred schedules. The restart feature enables the unit to start automatically after a power outage, which is an interesting feature if your house of area is subject to power cuts. Moving a portable system from one place to another can be a stressful exercise if it is not designed for easy mobility. The SpaceWise portable system features caster wheels that enable users to move the unit from one room to another with ease. In addition, it features integrated side handles that make it easy for people to lift it when there is need to do so. This unit weighs 64 pounds, which is still heavier than some more powerful competing models. For hot places, it can take longer to cool a room to desired temperature. This unit is designed to cool the room quickly and efficiently. To enhance this, it features a multi-speed fan that offers three distinct fan speeds. This feature allows users to switch to the most ideal speed depending on the condition of the room. In addition, the unit has an air direction control mechanism that directs the air automatically. The FRA053PU1 comes with a window sliding kit and an exhaust hose. The unit enables users to install it quickly and easily. In addition, its window sliding kit fits on most standard windows and there is therefore no need to do modifications. Even for users who want to install the system on non-standard openings, the modification required is usually minimal. Lastly, when buying, one has to look not only at the one-time price tag, but also at the lifetime value of a model. In that regard, it is expensive to use air conditioners that are designed to consume a lot of power. Thankfully, this unit is engineered to consume low power and it is therefore a cost-effective system. Its low power start-up helps in energy conservation and this enables users to save their money. So, a five-star review, then? Not quite! First of all, we should mention again that 5000 BTU is not huge cooling. The price tag (around $400) is higher than the average AC unit with this power. Second, its functions might not fare well in high humidity areas. You should know this before making your decision! Effective cooling. When installed appropriately, the system cools a room quickly and effectively. After all, this is what we are looking for, aren’t we? Reasonably quiet. This system is quiet and does not produce annoying sounds. Easy to install. Most users are able to install the unit quickly and easily. Draining water. The system has a water drainage opening where the user is required to place a container. For high humidity areas, it is necessary to empty the condensate on daily basis to avoid spills. A higher-than-average price tag. This Frigidaire 5000 BTU model is in the same price range as some 8000 BTU models. Quality has a price, here! I bought this unit for my 180 sq ft home office which needs more cooling power than our central unit can deliver. The room has 3 large east-facing windows which receive full sunlight for at least 4 hours each morning in the summer. It also contains a workstation-class laptop computer, 2 22" monitors, an external hard drive, and several pieces of networking hardware. With the doors closed this room easily reaches 85 degrees by noon each day in the summer (even with the window blinds closed), while the central AC maintains the rest of the house at 78 degrees. The first full day I used this unit I left it off and the office doors and blinds closed until 10 AM when the room had reached 84.6 degrees. After running full-blast for 1 hour the room temperature had dropped to just 78.9 degrees and never dropped below 78 degrees until the windows were shaded. If you have a medium-sized home office this unit will provide more than enough cooling power to negate the effects of your electronics, but if you don't already have central AC you will need a bigger unit. Keep in mind that the 5000 BTUs of cooling provided is enough to balance out the effects of about 15 100W light bulbs (each bulb produces 341 BTUs of heat per hour). You can calculate the wattage of other electronic devices by multiplying their power source voltage * amps (the wattage is sometimes provided by the manufacturer in the user manual). Also keep in mind that this is a single-hose unit which creates negative air pressure in the room where it operates. This causes some air to be drawn from other parts of the building to balance the pressure. If you need a portable unit as your primary cooling source you should look for a two-hose unit that maintains a more neutral air pressure." BACKGROUND- My house has central air, but my computer room gets hot on it's own, and central air doesn't kick in since the average house temperature isn't hot enough for it to kick in. So the solution? Get an air conditioner for just the computer room. I have a vertical sliding window, and that makes getting an affordable window air conditioner quite difficult. I settled for this portable AC. INSTALL- Installation of the window pane didn't take too long, and was generally easy. Only issue is that although the pane was more than long enough (maximum length of 48.5"; minimum of 26.6"), the amount of non-adhesive and adhesive seal was insufficient to make rounds around the window, resulting in gaps for outside air to freely come in, as well as potential bugs. Another issue is that the window pane has holes on it for screws that I'm not using (since this is meant for both vertical and horizontal window panels; so I'm not using the horizontal screws), and again, this will result in the outside air to freely come in, as well as potential bugs." The FRA053PU1 is a highly effective air conditioner that is ideal for small rooms. With a cooling capacity of 5,000 BTU, it is ideal for a 216 square feet space. When installed appropriately, it impressively cools the room with clean and fresh air. 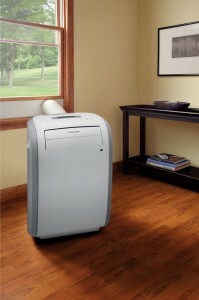 We were happily surprised with the power and the ease of use of this reasonably quiet AC unit. However, you’ll be the only judge to decide if it is worth the $400 price tag.